Like any trade guild, the Thieves Guild is an organization of professionals, except that in this case the professionals are burglars, robbers, pickpockets, smugglers, and other enterprising operators. They typically don't have public guild halls, but sometimes have safe-houses, and members tend to gather at a single location in large towns, such as at a cornerclub, inn, or tavern. Typically, members are bound not to rob each other, kill anyone while thieving, or rob the poor. 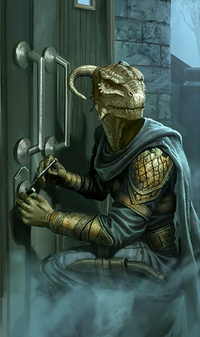 The Thieves Guild usually has the resources to bribe officials, establish a black market of stolen goods, and maintain a network of informants. The Thieves Guild generally operates along provincial lines, with little if any apparent coordination or true association between provincial chapters. Each provincial organization calling itself the "Thieves Guild" has had its own style and reputation. Advancement through their "ranks" varies based on the structure of that organization and the merits of the individual. Guilds in some of the provinces have been unheard of for centuries, though it's unclear whether it is because they no longer exist or if it's because they are very, very good. Near the end of the Third Era in the Iliac Bay region, the Thieves Guild was known as a sophisticated, powerful organization with guildhalls scattered throughout the land. The guild fought to keep its reputation as the best thieves in the Empire, taking out competition like the Wharf Rats and expanding their activities. By comparison, the Thieves Guild of Morrowind at the time was a fledgling organization which faced significant opposition from more well-established criminal syndicates, such as the Camonna Tong. They were led by a man named Gentleman Jim Stacey, and focused on thieving from wealthy nobles and merchants. The guild in Morrowind was purportedly eliminated by the Fighters Guild and the Camonna Tong before the Fourth Era began. Other provincial guilds have managed to operate more discreetly, such as the Thieves Guild of Cyrodiil, where it and its shadowy leader the Gray Fox are often considered to be nothing more than myths. Skyrim's Thieves Guild is headquartered in the city of Riften, where the group remains unhindered despite their notoriety. Fittingly, Skyrim's guild is more violent than most others, as it sometimes allows murder (authorized beforehand, of course). In the past, they have been one of the most influential organizations in Tamriel. Some stories claim that Barenziah, the well-known Dunmer Queen, was once counted among its members. It is thought that the strange markings seen around Skyrim are coded messages members leave for each other. Skyrim's guild has suffered decades of dwindling influence following the death of their guildmaster, a man named "Gallus" (purportedly Gallus Desidenius, author of The Nightingales). Rumors abound they have recently experienced a renaissance. For game-specific information on the Thieves Guild, see the Daggerfall, Morrowind, Oblivion, Skyrim, and ESO articles. ^ a b c Myth or Menace? This page was last modified on 10 November 2018, at 19:04.